The serious amount of hype from the production team for this episode originally served to be its undoing for me. No episode could have lived up to the 'scariest episode yet' tag and completely fulfilled the brief of being 'Doctor-Lite'. At the time I thought it was a good episode, where expectations for it to perform were unfeasibly high, but I do think it suffered from the lack of the Doctor and Martha dynamic and relied on surrogate companions that you needed more time with to develop the necessary emotional connections. Now, having seen it several times I think it's crept up on me, like one of the stone angels, and quietly won me over. If you look at 'Love And Monsters' from 2006, which was also fulfilling the same brief, it connected not just to the Doctor and Rose but also to the supporting characters and environs that Rose brought to the series. There was a direct connection to Jackie, to the estate and to events past with the flashbacks to the Autons, the Slitheen and the Sycorax. In 'Blink' I think the hardest thing I struggled with was this lack of connection - perhaps it should have featured Tish or connected more to the locations and spaces in which the Jones family operate? Instead, the episode introduced us to a set of new companions. It had a water-tight 'time travel' plot full of conundrums, something which Moffat always excells at, and some very witty lines which again he's good at, particularly his jibe at the nit-pickers of the on-line community with the 'wrong size windows' line where the police officer is describing the TARDIS to Sally, the penchants of drama commissioners at ITV with the 'Sparrow and Nightingale' gag ('Rosemary and Thyme', take a bow) and the effects of a 'timey-wimey' detection device on hens - that would be a sight to see! The triumph of the episode certainly lay in its desire to scare the living daylights out of its younger audience. With this in mind, 'Blink' connected directly to classic television scares such as 'Sapphire & Steel', 'Children Of The Stones' and 'Escape Into Night'. You could also connect this to 'Ghost Light' another Doctor Who story set in a strange old house. I am grateful that Moffat is bringing this kind of unsettling drama to a 21st Century child audience. And the idea of 'quantum lock' as a way that the angels manifested themselves took us into 'Schroedinger's Cat' territory too. Children need to understand their fears and healthy scares are few and far between in today's 'cotton wool' television landscape. His concept of alien angels killing people by trapping them in the past and then feeding off the energy released was a beguiling one. Their predatory nature keyed in with the 'dare to scare' potential of children's playground games and it's the episode's ability to understand the psychology of of those games that provided the highlight for me. The most significant scene was certainly where Sally and Larry are trying to get into the TARDIS - you have double jeopardy from the advancing angels, brilliantly caught in those rapid cuts by director Hettie MacDonald, and the imminent demise of the lightbulb. What could be worse? - horrible things creeping up on you [I]and[/I] fear of the dark. Sally Sparrow (another Moffat connection to last year's Doctor Who annual) was a likeable enough character, although I do think she took an awful lot in her stride to come across as entirely believable, and it's unfair to use her as a stick with which to beat Martha which seems to have been the tendency from other reviewers. I didn't feel as solidly connected to her as I did to Elton in 'Love And Monsters' and I put that down to too little emotional development and where Moffat did try to do this, it seemed a little forced because it hadn't been paid enough attention to during the rest of the story. Up until the final act of the episode, the pacing and development was a little slow and often padded but Carey Mulligan's central performance as determined yet vulnerable Sally did hold it together. My view hasn't changed dramatically but my appreciation for Mulligan's acting is certainly higher than it was. Hettie MacDonald also contributed some very atmospheric direction and editing, with the decaying house and its overgrown gardens populated by the observing angels providing potent images for young nightmares. The shots of the angels looking out of the windows of the old house, the backlit shot of Sally in the empty hospital ward and the quick cutting as the angels closed in were elements to be savoured. More women directors please! It's difficult to comment on Tennant and Agyeman because obviously they're not in it very much at all but I did like the idea of having their presence strung through the story as an easter egg on a series of DVDs. It's a novel way of getting round the situation and the brief. The weakest performance was from Michael Obiora as the detective Billy. I'm afraid he didn't convince me that he was a detective. And I wasn't entirely sure the sub-plot about Kathy re-starting her life in 1920 actually came off and again I put that down to trying to keep a complex, logical plot together to the detriment of our emotional investment in these characters. Overall a very good episode that like 'Love And Monsters' finds the virtues of not having the Doctor and his companion as the focus of the story and therefore has an opportunity to approach the universe that the series inhabits from a very different point of view. 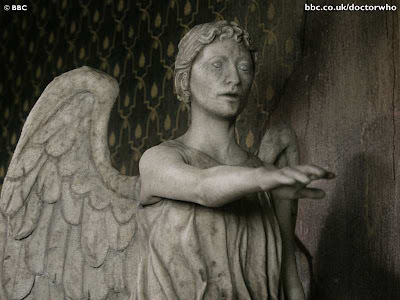 It's refreshing that the series can continue to do this and I would certainly be delighted to see the Weeping Angels in a return match with the Doctor himself and a cameo for Sally in a future episode. It does not match 'Love And Monsters' for me on an emotional level but it surpasses it simply as a chilling tale. It doesn't have the same emotional connection that the characters, and by implication the audience, had with the Doctor's universe. And certainly Moffat's 'The Girl In The Fireplace' remains his best contribution to the series thus far but 'Blink' runs it a very close second.